One of my favorite genres and one that is the easiest for me to push aside is middle grade fiction. This year to make sure I get a little more children's and young adult fiction I thought I would designate the first Monday of every month Middle Grade Monday. While a lot of my picks this year are classics I am trying to branch out a little bit and read new or at least recent releases. 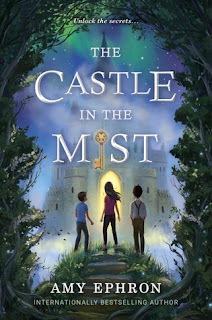 This month's book is The Castle in the Mist by Amy Ephron. This book is one I picked up on a whim because the library had it on the end cap and I liked the cover. Description: Tess and Max are sent to the English countryside for the summer and long for some excitement. So when Tess, out for a walk alone, happens upon an ornately carved gate and an old brass key, she decides to see what’s inside. To her amazement, she discovers the grounds of a castle filled with swans, bullfrogs, a hedge maze, an old-fashioned carnival, and a boy, William, just her age. William invites Tess back, and she can’t wait to return, this time with her brother. My Thoughts: This was a fun super speedy read that lacked any real impact. The story itself had a fairy tale quality with the mysterious castle and the boy who lives there. The castle is grand, the gardens are amazing and there is just a bit of magic hiding in the corners. I loved that Tess and Max used what there father had taught them to help them out when things got out of hand. I did enjoy reading this but it's a bit flat. None of the stories are developed enough for them to have any real impact and I didn't really feel like the main story was explored as much as it could have been. There's nothing wrong with it but it's not as good as it feels like it could be. If you have a child that loves to read this is one to put on their library stack. I think children from 8 and up would enjoy it but I don't think it's one that will stick. Just judging from my own kids I feel like this would appeal more to girls than boys. I don't think the Tornado would get caught up as much in the idea of the castle as my girls would have. If you're thinking the author's name sounds familiar she is in fact Nora Ephron's sister. Bottom line: If your kid discovers this at the library than I think they'd enjoy it and it's not painful for adults to read. However, it lacks the development and the magic to really make this a read that sticks. Ooh Nora Ephron's sister- that's interesting. Glad this one was good even if it wasn't super memorable. It's nice to see these middle grade reviews because I've been reading so little MG lately, I'm pretty out of the loop! I just saw this somewhere and can't place it...thanks for the overview and for the fun theme. I'm looking forward to others on your list. Did you include (or maybe already covered and I missed it?) books by Mary Downing Hahn? Her book, "Wait Til Helen Comes," was a childhood favorite of mine. And I have to admit it still creeped me out a little when I re-read it recently! Thanks for your comment at my site and I wanted to say, Game Night started out so silly we nearly turned it off but I'm glad we didn't. I wouldn't want to own it but it was a good one for pizza night. Humorous! I can't wait for my granddaughter to get into books like this. Right now we are still reading age appropriate for a 4 year old but I look forward to story lines! I wondered if she was related to Nora Ephron. Sorry this one didn't wow you a bit more. Sorry this one fell a little flat for you! It sounds so good on the surface. How disappointing! I’m also trying to read more middlegrade this year. It a genre that I tend to neglect. Sorry this one didn’t work for you. Hopefully your next read is better! I really like Middle Grade books, but rarely seem to read them. I do have to be in the right mood to pick them up. This sounds like a great idea to get around to reading more Middle Grade. Too bad this one fell a bit flat, but it does sound like it has a fun set-up.